Brick fireplaces are often heavy looking, unattractive, and can really date a home, which is why painting over a brick fireplace is something many homeowners decide to do. This isn't to say that natural brick doesn't have a place in the home - in some cases it does - but more often than not brick fireplaces end up looking dingy after several years of use. In recent years painting these fireplaces has become a well-regarded interior design technique. By painting over a brick fireplace, you can take a tired feature and turn it into a great focal point, potentially adding to the value of the home. It's very simple to do, doesn't take a lot of time or money, and will give your home an instant, uplifting makeover. If you want to give your fireplace a new look but can't afford costly renovations, painting is a great option. The most important thing about painting over a brick fireplace is to be absolutely sure that you no longer want the original brick to be visible because once it's been painted it is virtually impossible to remove the paint. As with any interior color choice, there are a few things to consider. You'll want to take into consideration the other colors in the room, the style of the room, and whether you want the fireplace to stand out or blend into the room. As a general rule, it's best not to use vivid colors on a brick fireplace. They have a tendency to look garish. White is always a popular choice and will give the fireplace and the room a clean, fresh look, but if you find white too boring try another soft color. Depending on the color of your room you might want to consider a soft yellow, pink, or beige. Neutrals are always fairly safe, and black can make a strong statement. If you want the fireplace to blend in you can paint it the same color as the walls, and if you want it to stand out paint it a contrasting color. Painting brick requires very few materials. Prepare and clean the brick. Wipe the entire area down with a damp brush, removing any soot, dust, and cobwebs. It's also a good idea to go over it with some sandpaper in order to remove any loose pieces of mortar. Vacuum the area all around the fireplace as well since there might be excess dust and ash around the base. Tape off the areas around the surface to be painted. It's a tedious step, but you'll be glad you did it. Be sure to cover the floor with drop cloths in case any paint spills or drips. If the bricks are really soot-stained, it's a good idea to prime them with an oil-based primer. This will prevent any soot from bleeding through the paint later. Let it dry completely before applying the paint. Apply the chosen paint with a paint roller designed for textured surfaces (available at home improvement stores). This will help get the paint into the tiny crevices, but it's likely that you'll also need a paintbrush to get the job done. Painting brick will pretty much destroy the paintbrushes, so don't invest too much money in them. Brick is a very porous material, so it's likely that several coats will be necessary. 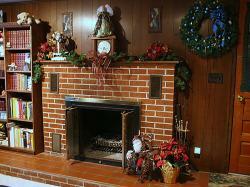 Painting a brick fireplace is a simple project that can be done in an afternoon. It will give the room an instant and uplifting makeover and freshen it up greatly. While sometimes it seems a shame to paint over natural materials, it's something you should really consider if your fireplace is dingy and dated. If it's ugly, change it. It's that simple.